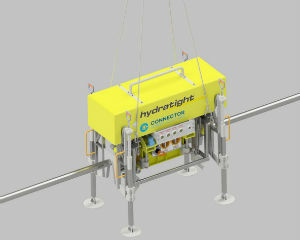 Engineering teams from Hydratight, a UK-based subsea connector specialists, and Norway’s Connector Subsea Solutions (CSS) have completed a milestone deepwater pipeline repair in Western Australia. A 4in MEG line, owned by a major national oil company (NOC), required urgent repair. It was pressure rated to 400 bar and was located at 830m, so it required a customized solution. The international team designed, manufactured and installed a diverless Structural Deepwater Pipeline Repair Clamp for the project. Prior to installation of the clamp, CSS and Hydratight also prepared the pipe using a remotely operated vehicle-based Coating Removal Tool. After successful testing and real-life completion for a major NOC, the companies can offer similar services worldwide to increase the lifespan of subsea installations. The clamps are DNV approved and will last up to 25-years in service.